What are these roof stains? Fungus arrives and collects on roofs and other exterior surfaces via Airborne Spores. Once attached to a shingled roof, this fungus begins to feed on the dead organic matter such as Asphalt (aka: your roof). As the fungus begins to break down the Asphalt, the Ceramic Granules that are layered on top of the roofing materials are loosened and begin to fall off. 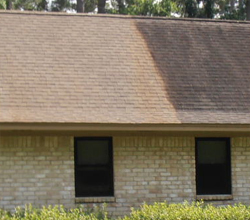 This leaves your roof looking unsightly or “stained.” Using our patented roof cleaning system, Spotless can safely remove this Deteriorating Fungus and make your old roof look NEW again!